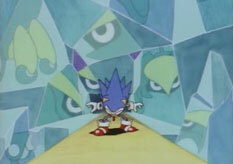 Sonic CD is the first game of the series to make the very rare use of anime style animation for both its intro and outro sequence (the only other thus far is Sonic Riders, much later in 2006), and the style itself is a common symbol for the game, aiding very much in its very Japanese style, compared to the others. To see the intro, you need to leave the game on the title screen (doesn't matter if you've already pressed start) without pressing any buttons for a good 10-15 seconds, and it will appear. The outro has two slightly different versions to it, depending on whether you got the good ending or the bad ending, and will be shown upon completion of the game, with the credits if you're playing the Mega CD or PC version. You can view everything at your leisure in "Visual Mode" when you unlock it, and both movies can be seen from the get-go in either Sonic Jam for the Saturn, or the original version (not "Plus") of Sonic Mega Collection for the Gamecube, both of which are Sonic compilation packs. Note that the music for them, as everything else does, varies between the US and Japanese/European versions. 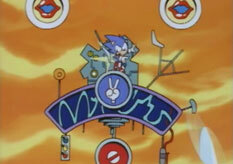 The latter features a catchy, funky tune by the name of "You can do anything" (sometimes better known as "Toot Toot Sonic Warrior", as its baffling lyrics suggest) for its intro, while the outro has pop-ish song "Cosmic Eternity", both sung in English not Japanese. The US does quite well to counter, with "Sonic Boom", a melodically pleasant tune, and the outro features a calmer and more instrumental version, also used as the bgm for the Time Attack menu. 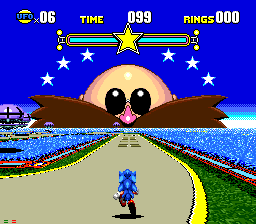 The intro is kind of a prologue to the game, and takes place entirely before the first level, as Sonic first discovers that Little Planet has been taken over by Eggman. He's shown running through Never Lake, a rocky, but grassy area containing forests, canyons, rivers and, fairly unsurprisingly, lakes. 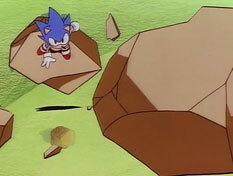 Before making the discovery, Sonic spends much of his time showing off his athletic talent by leaping over and between rocks, skimming over water, running around looping curves and solid vertical walls, and going full speed across long, flat areas. No tour bus necessary for this guy. 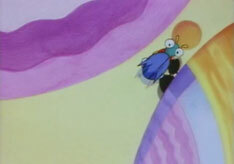 Many of these scenes are shortened or removed for the Mega CD version, which runs at a lower framerate, with different animation textures, so to enjoy the full experience, you'll need to see it on anything other than the Mega CD. It's when Sonic climbs a peak by the lakes that he spots the fully mechanised Little Planet, attached to the huge long chain he's already spotted while tackling some falling rocks. 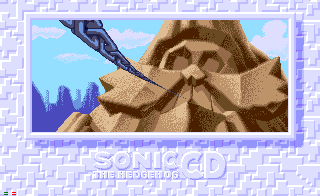 The Mega CD version alone also indicates that the chain is attached to a rock whose features have been cut out to resemble Eggman's face, so there's no question about which particular evil scientist has had a hand in this devious act. Our spiky saviour has seen enough, and hurtles down the rockside to hit a ramp that launches him straight up in the air, where he lands on the chain and runs along it. The outro begins with a movie that shows the ending events of the story, and then revisits some of Sonic's adventures across the levels of the game. 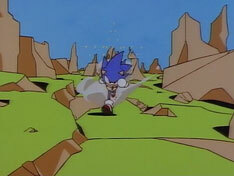 Firstly, Sonic is escaping the collapsing factories, carrying a frightened Amy in his arms, and for the Mega CD version, sound effects are included before the music begins. They tumble down from the planet back to Never Lake below, and Sonic manages to stand her up and quietly sneak away before she has a chance to cover him in her fangirl love. Phew. 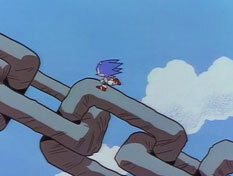 Eggman's plans are in ruins as bits of steel chain fall to the ground and a now fully restored Little Planet grows ever more distant. This is where things vary just a bit depending on whether or not you beat the game with all Good Futures, but both variations are quite positive. 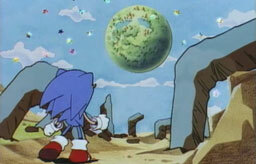 In the good ending, Sonic gazes on in amazement as Little Planet begins to shake and produce lots of cosmic stars, as the image of Sonic's face appears in front of it in those stars, just before the whole planet ascends and disappears into a big question mark. 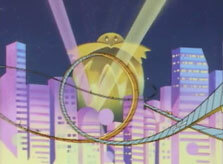 In the bad ending, Eggman, tattered and defeated, manages to escape in his worse-for-wear flying scooter, seemingly still holding a Time Stone. 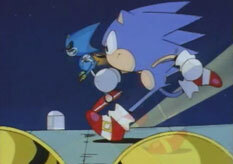 Sonic takes care of him by picking up a stone (a regular one) and using a super-powered spin dash to hurl it in the air. It hits Eggman and his machine disappears in a cloud of smoke that just happens to resemble his moustached head, but something I've never quite understood is that the stone seems to travel low along the ground at first, and then move straight up to hit Eggman.. Or maybe I've got Eggman and the stone the wrong way round, as they're both in the distance, and it's hard to tell! 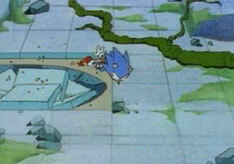 Anyway, in the version of this movie that's available for viewing in Sonic Mega Collection, both ending sequences are contained within it, so there's a bit of a continuity error when the Little Planet is still there in the background as Sonic throws the rock, even though it just disappeared. It also runs at a more comfortably smooth framerate than in any of the actual versions of the game. 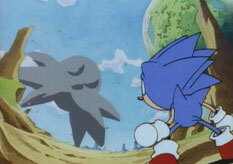 After that, the movie reflects on Sonic's long journey by showcasing brief animated highlights of each level, and in the PC and Mega CD versions, this section gets shrunk down compared to the previous animation, in order to fit the scrolling credits to the right of it, against a black background. Credits are not present in the Gems Collection version and the whole outro animation plays full screen. 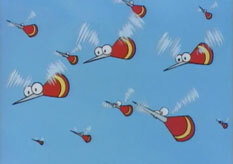 Firstly, Sonic can be seen dodging a collection of needle-nosed mosquito bots in Palmtree Panic, before we cut to a relatively vague representation of Collision Chaos with a plain orange background. 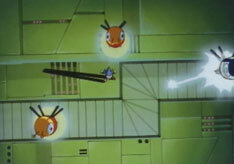 Sonic is seen deflecting the nail-clipping-like blades of the level's mantis robots, before bouncing between blocks as he tumbles downwards. Then, what you might presume to be Tidal Tempest, but may well just still be Collision Chaos, as Sonic simply rolls into that mantis robot which then explodes, though the surrounding terrain is not quite clear. Quartz Quadrant is much more obvious, as Sonic tackles one of those blue and yellow scorpion cannon robots on the mine's conveyor belts, after emerging successfully from the explosions it produced amongst the crystals. In Wacky Workbench, Sonic descends down through the large factory on one of those circular platforms, only to be harassed by three wheeled robots from Metallic Madness brandishing front-mounted circular saws. They are, of course taken care of with comic style. Straight to Metallic Madness for the moment, and Sonic dodges the light beams of the three deadly light bulb flies from the bit just before the final boss, and this is followed by a quick backtrack to Stardust Speedway, where Sonic races Metal Sonic through the dizzying twists and turns of the course, overlooked by an ominous, golden Eggman statue. When all is said and done, you get a final animation scene, which again depends on whether you earned the good or bad ending. 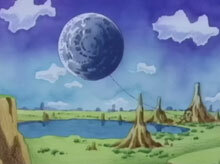 For the good, loads of happy, bouncy flowers magically sprout up over the fields, but in the bad, the fully mechanised, Eggman-controlled Little Planet reappears over Never Lake after warping in, with the message "Try again" or "Try again and free Little Planet forever!" From the full animation, available on Sonic Mega Collection, there is also a scene that's cut out in all versions of the game and some people believe it to be based on a stage that never actually made it into the final release of Sonic CD. Between the Palmtree Panic and Collision Chaos clips, right where evidence suggests that there was going to be a mystery second level in the game, Sonic takes a trip across a dingy, old factory floor with many collapsing panels. As factory environments are very common for Bad Futures, this could vaguely be just about any level, but it's the appearance of an unknown enemy with massive jaws that encourages the belief that this may be the missing second stage, which small clues hidden away in the game indicate the intended existence of. This animation can also be found in the pencil test movie of the Visual Mode. 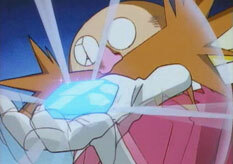 As far as the 'invisible' rock that Sonic throws goes, If you play the S.M.C. version, you'll see this. Sonic spins and throws the rock...the rock travels the same direction Sonic is spinning, so it's 'running/spinning' on the ground, traveling along and gets thrown upwards [via a rock in the shape of a ramp] and blows Eggman out the sky. 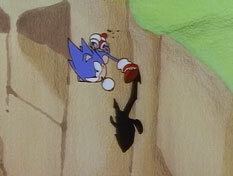 As you said, SegaCD/MegaCD couldn't show the whole animation, so they had it bordered. 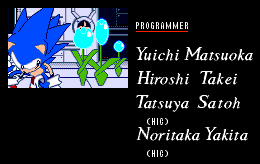 Oh yeah, if anyone has ever played the Sonic hack 'Sonic Megamix 1', you'll see that boss [clipper one that isn't in Sonic CD] in the game. I forgot what Zone it's in, but one of the early ones. Actually, ALL of his quills are facing the wrong way. Strange. 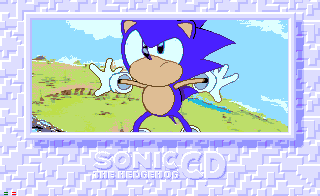 As I have mentioned throughout this guide, Sonic CD comes with two separate soundtracks depending on your region or version of the game, and both make use of the CD-based nature of the game's format, to produce CD quality music that, unlike the regular Mega Drive games, is not restricted by the console's sound hardware. Firstly, there's the original, composed by Naofumi Hataya and Masafumi Ogata and often held in very high regard by Sonic fans and gaming journalists alike. The level music is suitably Sonic-like, particularly good at fitting appropriate tunes and instruments to the levels, and especially the separate Past and Good and Bad Future variations. It's also the first Sonic soundtrack to feature vocals for some of the music, namely the opening and ending themes, "You can do anything" and "Cosmic Eternity", performed by pop singer Keiko Utoku, though all lyrics are in English. The US soundtrack however features entirely different music for all tracks except for the Past tunes, which don't exist in US forms, so the Japanese ones are used for both soundtracks, despite the fact that all other US tunes for each level are completely different from these Past ones. Unlike all the other music, the Past tracks are contained within the game itself as PCM files, rather than audio tracks on the CD. The US soundtrack was composed by Spencer Nilsen, who has gone for a decidedly un-Sonic take on many of the tracks, which are less about memorable, catchy tunes and more about trying to fit the environment in a slightly more movie-soundtrack way of doing things. 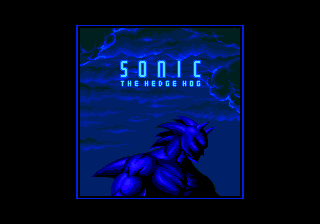 This is more like the soundtracks you get for most other games than what you would expect from a Sonic title. I've found most people prefer the Japanese one, and so do I, but most of these tracks aren't particularly bad, especially the Present versions, and it still has its devoted fans. I find the other timezone alternatives for each level to be a bit too similar to each other, and not indicative of the good/bad vibe that they should have. Still, it's all just opinions really. 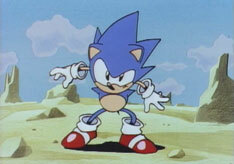 The US soundtrack features its own lyrical offering called "Sonic Boom", a popular piece of music by Pastiche, which plays during the animated opening, and an instrumental version for the ending movie. Now, what versions and regions of the game have which soundtrack? Well, for the original Mega CD release, the Japanese and European versions feature the full Japanese soundtrack, while the US version was delayed by a month to incorporate Nilsen's own soundtrack. Why anyone felt a new soundtrack was necessary anyway is beyond me, but what's done is done. A few years down the line for the PC version, and apparently because of copyright issues (or something), all three regions, even Japan, were lumbered with the US soundtrack. For Sonic Gems Collection, the option of having a choice between either soundtrack was possible, but once again, copyright laws preventing each soundtrack to be available in the opposing continents stopped this from being possible. Damn those lawyers. Japan's soundtrack however was returned to its homeland in pristine condition, but unfortunately, Europe was apparently not entitled to it and we received the US soundtrack once again, instead. I foresaw that happening, so I was clever and imported 'Gems from Japan. For those of you that wish to do a little do-it-yourself for arranging the soundtrack correctly, here's the order that all the music should be in, so that they accompany the game correctly. This is particularly useful in emulation software, where you have to download all the music separately and rename them so they fit the following order. If you download both soundtracks, you can alternate between them according to your tastes, if you feel so inclined. Give each track its corresponding (two digit) number, according to the list above, and "scd_eur" is the name of the .iso file of the game, which should be placed in the same folder as these .mp3's. Consult your emulator help files for more details. You should also add that the 2011 re-release of CD lets you choose between the US and JP soundtracks on the main menu in all regions. Not so easy to get hold of these days, but a PC version of the game was released in 1996, and later ported to the PS2 and Gamecube in Sonic Gems Collection. As I've mentioned numerous times already. The PC version is mostly the same as the Mega CD original save for a few small differences. For one, the intro and outro feature the full, uncut animations, while the saved game structure has also been redesigned. Using the new "Saved Games" menu, you can store up to six plays of the game at the same time, though each has its own set of time attack records and unlocked features. The biggest change to affect the gameplay directly though is the fact that you now only need to have a time warp activated for three seconds in order to time travel. The original requires a more challenging five seconds, so the PC version is actually a little bit easier. It also only has the US soundtrack, regardless of what region it's from. A full installation of the game allows you to play it without the need for the disc, but all the music is stored on there, so you'll be playing it in silence. If you want the Japanese soundtrack and have downloaded the tracks in .mp3 format, you can actually burn your own disc with them on in the correct order (see Soundtracks section above) and use that instead of the original disc. I haven't tried it myself, but I understand it does work. The following are the system requirements for the PC version, but as these are based on typical 1996 configurations, you'll find them pretty outdated by today's standards. ..so outdated in fact that Windows XP and presumably anything later than that will not run this game by default! I've also had problems running it on Windows 98 as well, as it tends to crash after a while, but I've heard that it's supposed to be ok in that. Never fear though, because the Sonic community has been on the case and a special downloadable patch for the game has been created by Korama. All you have to do is download it, run it, locate the directory that contains the soniccd.exe file from the full installation of the game, and hit the "Apply Patches!" button. It should then work under Windows XP, 2000, and possibly 98 as well. Consult the readme file within the patch for more information. You can download the patch right here! To unlock the D.A. Garden mode (an enhanced sound test), brush up on your level speed runs in Time Attack mode so that the total amount of time from all of your best records is less than 37'27"57. The option then appears on the main menu. See the D.A. Garden section for more details. To unlock all of the Special Stages in Time Attack mode, get your Time Attack total time down further still to 30'21"05. You can then select the seven different Special Stages by pressing left at the Time Attack stage select screen. Visual Mode allows you to view the intro and outro animation sequences at your leisure, as well as original pencil tests of said animations. To access this from the main menu, get your total Time Attack time down to a positively miniscule 25'46"12. At the title screen, press the following sequence of buttons: Up, down, down, left, right, B (Or Spacebar for the PC). A ring chime will sound and you'll be taken straight to the stage select menu, which consists of a list of numbers and letters, such as "1-1-A", and you can change their value with the up and down buttons. The First number on the far left indicates the stage number, so Palmtree Panic is 1, then 2 is skipped (believed to be a level that never made the final cut) and 3 is Collision Chaos, 4 is Tidal Tempest, etc, all the way up to 8, which is Metallic Madness. A little confusing, I know. The number after that is the zone, 1 to 3, and then A is the Present, B is the Past, C is the Good Future and D is the Bad Future of that zone. 1-3-C and D appear between levels 3 and 4 for some reason, rather than with the rest of 1, and between levels 1 and 3, there are additional options of "WARP" (the small time warp sequence), "OPENING" (the game's opening movie, obviously) and "COMMING" (an odd scrolling message that simply says "Comin' Soon", accompanied by the invincibility theme). "SPEDEMO" between levels 8 and 1, is a brief demo of the first Special Stage being played, and all of these return you to the title screen afterwards. When you select a particular timezone from a particular zone of a particular level to play, you will only play that one timezone of that one zone of that one level, and as soon as you complete it, successfully perform a time warp in it, or even just die once in the PC/Gems version, you'll be returned back to the title screen where you'll have to re-input the level select cheat to return to it. Only really ideal for sampling some of the hidden contents of the game then, rather than jumping to a particular point and playing from there. However, should you time warp out of any zone, and then go back into the stage select and pick a different zone (and it can be any other time zone and from any other level), you'll appear in the new zone, at the same point as the place where you left the previous zone. At the title screen, press the following sequence of buttons: Down, down, down, left, right, A (Spacebar for the PC). On the Mega CD version, you'll then be taken to a screen featuring the following text: "FM NO.00 PCM NO.00 DA NO.00" I've no idea what the letters stand for, but FM (0-79) contains most of the game's sound effects, PCM (0-16) contains all of the Past tunes and a few more sounds, including Sonic's rare voice clips, and DA (0-33) contains all of the other pieces of music in the game. In the PC/Sonic Gems Collection version, there is no FM category, but the PCM one has grown to encompass the full 0-79 list of sounds. Use the up and down buttons to alter the selected track number, left and right to change your selection between the two or three categories, A B or C to play the selected track and start to exit to the title screen. Debug mode allows you to move freely around the levels and place certain objects down wherever you like. To access it, go to the Sound Test menu, described above. Change the track lists to read: FM NO.40 PCM NO.12 DA NO.11 for the Mega CD version, and PCM NO.12 DA NO.11 for the PC/Gems version, then press start. It doesn't seem to matter whether or not you play any of the tracks first. 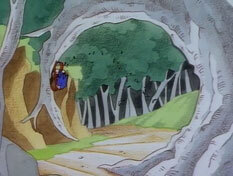 You'll then be warped to a piece of artwork featuring Tails and, very randomly, a jeep. The picture reads "See you next game" and is signed by Judy Totoya (the nickname of Yasushi Yamaguchi, creator of Tails), with the Time Attack menu music playing. Press start to return to the title screen where you can either continue the main game as normal or enter the level select cheat. Either way, you'll be in debug mode from then on. It doesn't seem to work properly in Time Attack though. Debug mode allows Sonic to transform into any one of most of the objects that appear in the level. You can move the object around anywhere using the directional controls and lay down as many instances of your selected object as you like, while the score, time and ring tallies are deactivated. Press B (or Esc on PC) to toggle between playing as Sonic and controlling the chosen object, and only while controlling it, use the A button (or Spacebar) to cycle through the available objects and place an instance of it using C (the C Key, on PC). Sadly, on Sonic Gems Collection, the C Key hasn't been incorporated into the controls, as the game is a port of the PC version, and so you are unable to place any objects anywhere. These objects do not stick around anyway though, because as soon as you leave the area and return, you'll find that all your hard work has disappeared. Something to have a bit of fun with though, and to prove highly useful when writing massive game guides like these, of course. 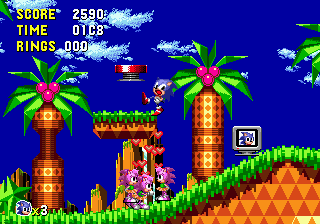 Something I've noticed, in Palmtree Panic Zone 1 Present, you can make multiple Amy's whose collective grasps can propel you extremely high when you jump out of them. 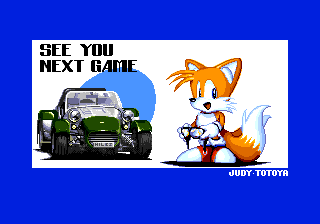 A picture of Tails and a Jeep, with the text "See you next game". Indeed you will, my friend. This artwork also subsequently unlocks the debug mode afterwards. Comes with "Little Planet" or "Sonic Boom" Instrumental music. An homage to Batman, but replace "Bat" with "Sonic", essentially. Kinda cool, but also unusual. Comes with the final boss music. 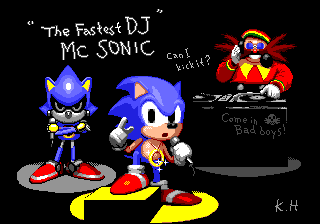 "The fastest DJ, MC Sonic".. yes, this is technically "official" art. Comes with Metallic Madness Present music. 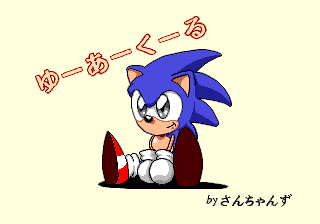 A fairly cutesy Sonic, surrounded by Japanese text. Comes with Palmtree Panic Good Future music. A wallpaper of Sonics, each with a Japanese face, and more text. Mad. Comes with the boss music. Here's an unusual and fairly pointless trick. At any point in the levels, leave Sonic standing and don't touch any buttons for 3 minutes. He will then say "I'm outta here" in a Japanese, "Engrish" sort of way (one of only two voice samples in the game), wag his finger at you and use rare sprites to leap out of the foreground and away, which automatically gets you a Game Over and returns you to the title screen. You think all that foot tapping was just an empty threat? Now you know better. 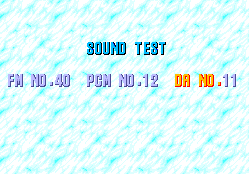 To play a secret Special Stage originally planned for the game but eventually left out, enter the following numbers in the Sound Test menu; FM#07 PCM#07 DA#07 and press start, and just PCM#07 DA#07, then press enter, for the PC version. A message saying "welcome to secret Special Stage" will appear. Press start again to begin. 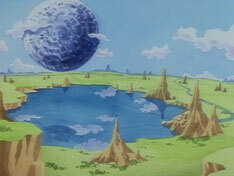 It features a giant Eggman head and stars in the background, and is pretty tough, with large masses of water and very thin roads through them. For the Miscellaneous section, I figured I could offer translations of the Japanese text from the hidden images. 'さんちゃんず' is the artist, as you would expect, 'sanchanzu'. 'たのしさ' - 'tanoshisa' roughly, 'it is the present'. It is the present forever? I might be missing something here. 'まじん画' the artist, identified as 'majin kaku'. Er, 'Sega Enterprises' should be 'セガ・エンタープライゼス', and I mistyped the artist, as well: 'まぢん画', which should actually be 'madin' and not 'majin'. Time for some coffee, I think. 'たのしさ' actually means "fun" (noun form, as indicated by the final 'sa'). Therefore, "infinite fun." 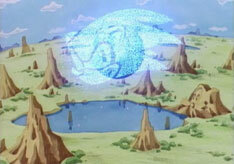 As far as Sonic leaping off the screen, it could be for several reasons. 2) Preventing your TV screen from blowing out [some people didn't have great TV's back then...I would know lol.] Just like how a computer has as screen saver even though the monitors usually last years, think of that like a screen saver. 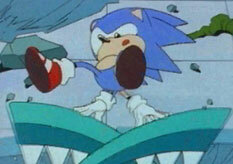 3) Because people think that Sonic tapping his feet is just for a fill in...sike. Sonic Team did an amazing job with this one! It's likely that all of those possibilities are wrong, but I know for sure that it wasn't a 'pointless' feature. And that vehicle above is not...at all...a Jeep. It's a Caterham Super 7. 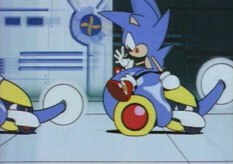 Hey guys, turns out Tails had a Caterham Super 7 since 1992! The is a new hidden picture in the Sonic CD 2011 remake if you put in PCM#32 and DA#08 this code also ulnocks level select for Tails in the remake. Is there a debug mode for xbox 360? 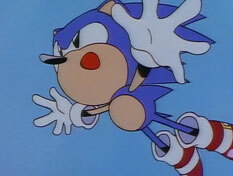 So was the Tails picture a secret hint or something about Sonic 2, where Tails debuted? Although Sonic CD came out a year after Sonic 2, wasn't Sonic CD supposed to be the Mega CD version of Sonic 2, started at the same time as Mega Drive Sonic 2, but then development on the game changed to what we know now? 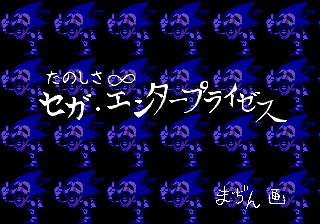 Actually, the text on the creepy image with all the masked Sonics on a black background says "Fun is infinite with SEGA Enterprises -Majin". Majin is the Japanese word for Devil. It's been said that the screen was an anti-piracy screen, meant to scare away people who pirated the game. "they're not your average Sonic images (...no, no, not THOSE kind of images. Eww, trust you. Just slightly odd ones)"
I think the weird mask picture looks a lot like Eggman, and I'm sure that TONS of you guys agree with me. My opinion on that picture is that it is much more nightmare fuel in the US version, am I right? Of coarse I am; the Japanese Game Over tune sounds a lot better. 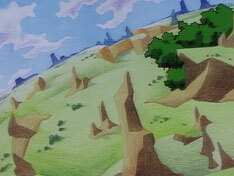 Now, I think someone should upload the map of the secert Special Stage and give more information about it. I'm not exactly sure what Yuu Aa Kuu Ruu could mean, but the artist is "Sanchanzu"
The 'I'm Outta Here!' 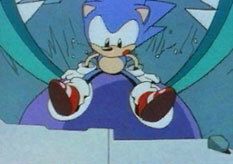 easter egg remains in the 2011 re-release, but only for Sonic. Tails will not do this if he is selected. In fact, Tails is absent of any voice clip (for good reason) and if he were to get a 1-up by any means, the 'Yes!' is replaced by a chime. Majin means devil. The message is signed "The Devil". It means "You Are Cool"
I believe PCM and FM are Genesis sound file formats. 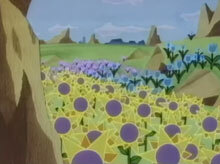 I still have no idea what DA is, but considering the DA Garden, it could just be shorthand for the CD Audio Tracks. Disc Audio, perhaps? You've got the translation right, but, Majin doesn't mean "devil" in this case. Majin (likely a pseudonym) was given a "special thanks" once the special stage is cleared and a hidden credits screen pops up for beating it. So no, it isn't Satan that's giving you that message. 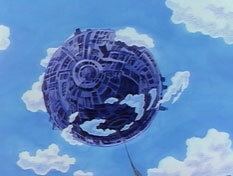 You can contact me under the Mobius Encyclopedia wiki.